A 6.1-magnitude earthquake hit Afghanistan on Wednesday, Jan. 31, killing at least one person and injuring dozens more in nearby Pakistan. 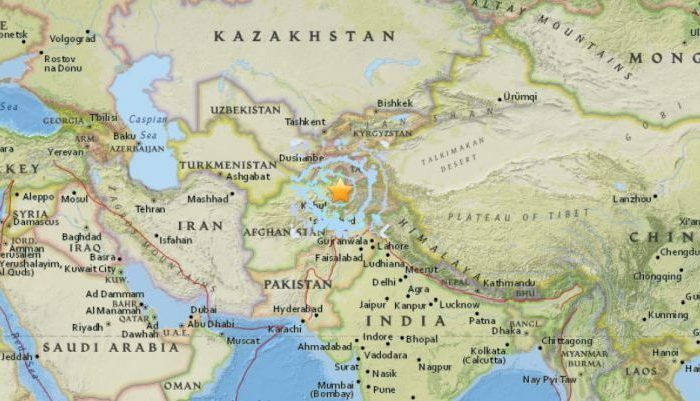 The U.S. Geological Survey said the tremor hit Afghanistan’s northern border with Tajikistan in the Hindu Kush mountain range. According to Voice of America, a Pakistani girl was killed by the earthquake, which hit hundreds of miles away. The lone death occurred in Pakistan’s Baluchistan’s province, and the girl was killed when the roof of her mud-walled house collapsed. About 10 other people were injured, according to Reuters. The quake rattled buildings in the Afghan capital and was also felt in parts of India, Reuters also reported. There were no immediate reports of any serious damage or casualties in Afghanistan. A Pakistani official said that two quakes occurred in the country on Wednesday. In October 2005, about 75,000 people died when a 7.6-magnitude quake hit northern Pakistan. Large parts of the region are seismically active because a tectonic plate, known as the Indian plate, is pushing north into the Eurasian plate.